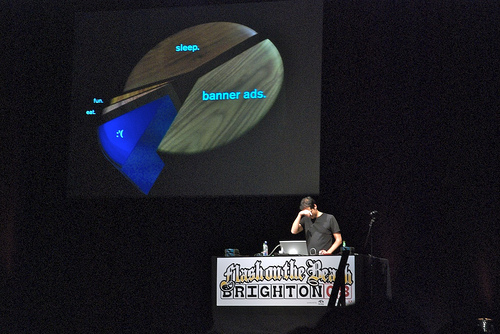 for working, he told a packed Brighton Dome at the recent Flash on the Beach conference. The rest of the diagram, a big cheese-like wedge that represents more than 50 per cent of his entire life, is taken up with ‘fun stuff’. Above: Hodgin’s dystopian pie chart. Photo: Silvia Baz. Hodgin got out of this vicious cycle by persuading his partners at the Barbarian Group that he should spend more time doing stuff that didn’t necessarily have an immediate financial return. 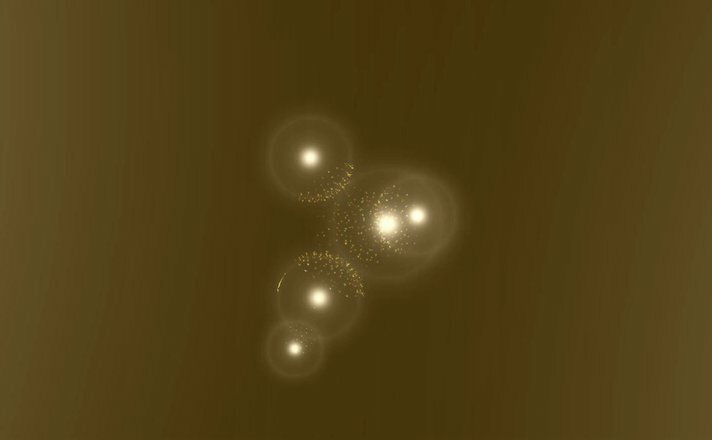 Such things include entering an online competition to visualise a track from Radiohead’s latest album (he didn’t win, but he got a certificate). A nice Goldfrapp experiment. Or finding ways to create digital smoke (with the help of NASA) or simulate crashing waves. ‘I’m fascinated by difficult puzzles, he told us. ‘I get bored looking at the ocean, but I’m fascinated when someone can model the ocean.’ And this freewheeling has led to some commercial commissions, such as a ‘Baroque’, real-time visualiser for the energy drink Relentless. 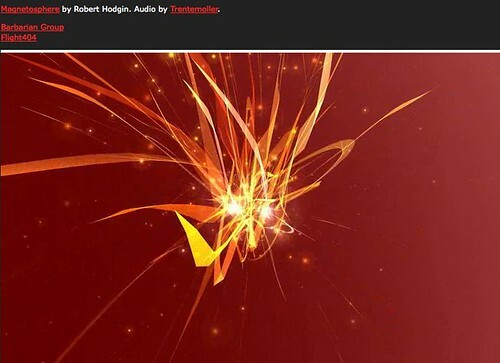 Hodgin claims not to experience synaesthesia, but his interest in the phenomenon of seeing sound as vision goes back to a fateful evening (1 November 1991) when he dropped four tabs of acid and put a Cocteau Twins boxed set on the autochanger. (This was in the days of Vaughan Oliver’s elaborate packaging design and actual vinyl clonking down on the turntable). This, as he titled his lecture, resulted in ‘The Best 8 to 12 Hours of my Life’. The next day, Hodgin applied to art school. He eventually studied at RISD, and a glittering career (plus lots of banner ads) ensued. And he hasn’t taken any illegal substances since. And Hodgin’s art is quite special, a kind of superior abstract animation that demonstrates his sensitive eye for sound – shown by his visualisation of Trentemøller’s sublime ‘Miss You’ (you can find an earlier version on YouTube). And though such finished products might seem complete, you sense that he is more interested in the process of setting up a system – a machine that can surprise. In this respect, his work relates to the experimental music and art of 1960s pioneers such as John Cage, Tom Phillips and Steve Reich, and successors such as Brian Eno and Shirin Neshat. Above: Another example of Hodgin’s work, responding to a track by Tosca. Hodgin’s own, highly absorbing website is Flight404, apparently named after either the familar error code* or the hijacked Japanese airliner. 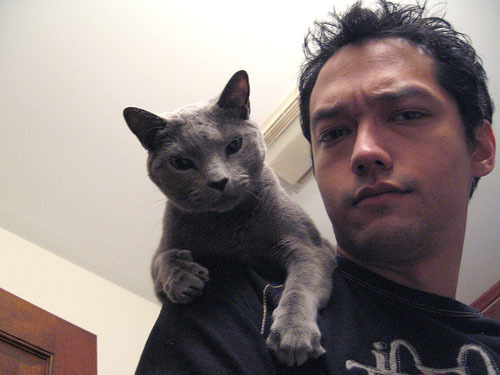 Above: Hodgin and friend, from the homepage of Flight404. * Some Eye newsletter recipients encountered a 404 the other day when we sent them a tried, but not throroughly tested link to our new Eye before you buy thing. Sorry about that. This link should work now.